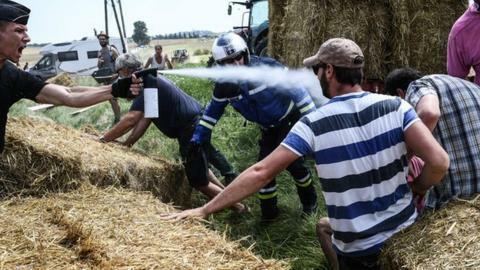 The Tour de France had to be stopped temporarily during stage 16 when the peloton was sprayed during a protest by French farmers, with several riders needing medical treatment. Hay bales were thrown across the road 29km into the 218km stage from Carcassonne to Bagneres-de-Luchon. TV pictures showed a policeman using a spray on protesters which then blew into the peloton, with riders pulling over to douse their eyes with water. There was a delay of about 15 minutes. There was a short neutralised section before racing began again properly at the 33km mark. Briton Geraint Thomas, who is in the leader's yellow jersey, four-time winner and team-mate Chris Froome, and world champion Peter Sagan of Slovakia were among those affected. Several riders went to the doctor's car at the back of the peloton for treatment. A social media post by the Quick-Step Cycling team read: "Looks like the tear gas used by the police on the farmers ended up getting to the eyes of some riders." France's Julian Alaphilippe won the stage after Britain's Adam Yates crashed on the final descent while leading. Team Sky's Thomas retained the yellow jersey and remains one minute 39 seconds ahead of Froome in the general classification.